One young gentleman at Ultimate has grown, pruned and perfected their facial hair for this month’s charity moustache growing event. The men (and even the ladies) have helped raise funds and awareness for men’s health, in particular prostate cancer – a disease that has touched many people’s lives and one that we are only too happy to do our bit for. 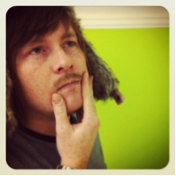 Our mo bro sported a classic tasche, that grew from just a mere bit of bum fluff to a mighty moustache. This epic moustache single handily raised an impressive £40.00 for the charity.